The Santa Barbara Society of Model & Experimental Engineers is an umbrella organization I instigated in 1990 to corral all of the amateur scientists and tinkerers in my neck of the woods. There weren't enough folks around to make a one-pursuit-specific organization, like steamboaters or clockmakers only and it was (and is) my belief that folks with dissimilar creative interests still have much to share. Individually we're all "weekend warriors" who tinker in our own or each other's shops. We gather at one house or another for a monthly meeting to talk about this and that project, to benefit from our collective workshop experiences, to swap inspirations and to pig out! This line drawing is from the contest brochure, which includes detailed instructions for building one such car, as well as a copy of the (very brief) contest rules. Here's an isometric rendering of that same vehicle. NOTE: the one described in the plans is slightly different, so great variation in design is possible. 1) The car must be steam (i.e. pure H2O) turbine driven. 2) Only lead based soldering is allowed on the boiler. 3) A car will run on a smooth level indoor surface between marked lines at least 2 meters apart and 30 meters long and in an ambient atmosphere. 4) A car is allowed 20ml of pure metylated spirit fuel loaded into the vehicle at the start. Before fueling, the burner must be empty, no other form of energy may be on board and all systems must be at atmospheric pressure and temperature. During a run, no energy may be added apart from that needed to perform adjustment and control. No fluids apart from lubricants may be added during a run. 5) A car shall be self propelled but minimal assistance may be given to initiate motion, if a vehicle stalls and to change direction. After a direction change a car may be pushed off at its normal speed. -Although he couldn't attend the August meeting in person, Ed Websky had previously dropped off his magnificent version of the Micro Steam Car Challenge racer. Departing radically from the "standard model" this vehicle is made largely of brass tubing and the turbine rotors were milled from solid aluminum disks. Using a 2-step pulley system and rubber bands for drive belts, Ed has fashioned a remarkable machine. To facilitate rubber band replacement, a simple wire "latch" is incorporated, between the idler pulley and the front wheel. When this latch is released the front fork can be spread apart, releasing the front wheel, the intermediate pulley and the turbine rotor, which all have axles with conical depressions in their ends, that run on pointed bits of wire that are fastened to the frame halves. 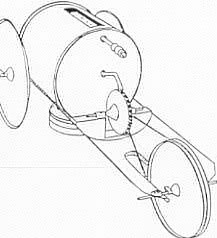 This side view shows the relation of principal components, including the tubular frame, turbine disk and drive reduction and the boiler. The bottom view reveals a bit more, including the rectangular burner and its attachment with 4 mashed brass tubes and dabs of solder, as well as the front fork assembly. Rear wheels are whittled from 1/16" thick brass sheet and the smaller diameter aluminum front wheel with its vee-groove was made on a lathe. The August meeting was a joint function between our organization and the Los Angeles Steam Automobile Club. 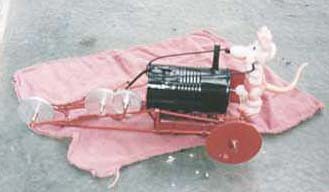 Ken Kowal brought up the Likamobile whose steam plant ran superbly, although the rear axle suffered a mechanical failure when a retaining ring failed. Also present was the incredibly kludgey, but nonetheless functional minimalist steam go-kart built by ??? and operated by his daughter. This contraption pulled many folks around in an attached wagon. Here are Categorized Links of interest to Home Shop Machinists, Tinkerers and Model Engineers and others.